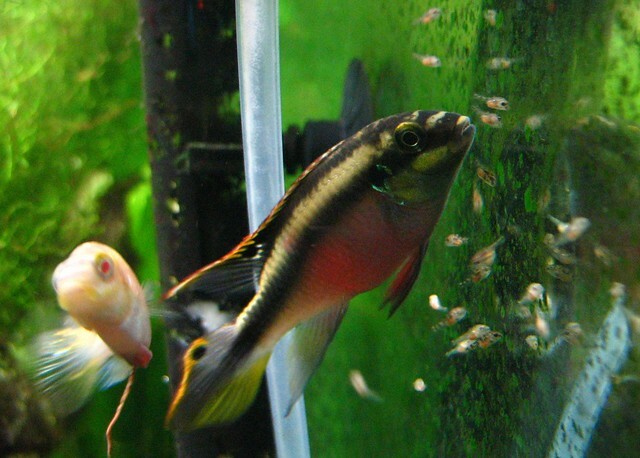 The Kribensis is a very colorful and beautiful fish with both male and females offering brilliant colors. Even though they are both colorful, you can tell the differences. Females are shorter, have reddish/purplish larger stomachs, and rounded dorsal fins. These fish are also very popular as they are very easy to take off even for younger children. The fish were home at Ethiop River, Niger Delta where the water offers low-lying blackwater streams, which is acidic and more alkaline and has harder water than other streams that join the river. Your Kribensis love caves or other small hiding areas where they will feel a bit more at home even if your fish were never actually there but only ancestors. Adding real and artificial plants to the aquarium would be a nice enhancement but the plants will need to be buried very well as this type of fish does not like to burrow and will uproot the plants if possible. The fish are trying to destroy their home; it is just instinct to burrow. Not only will your fish want a few places to hide, they also need room to swim. The aquarium should give them plenty of room to swim and hide. In a smaller environment, kribensis have been known to become aggressive as there are territorial. As long as you have given them adequate, room to swim you will enjoy watching these fast swimming fish to stop quickly and turn directions. The best size aquarium for these fish is a 20 gallon. If you wish to introduce other fish to your kribensis, bottom dwellers and slow-moving fish are not the best. Even though these fish are not necessarily aggressive, they tend to nip at the fins of slow fish like the Angelfish. As well as the bottom-dwelling fish, these fish will feel threatened as if their territory is being taken away by the new fish, so other fish that enjoy hiding in caves are also a no-no. Your fish should be fed no more than can be eaten in five minutes. They enjoy all kinds of fish food including flakes, lives, granular, or frozen. If you have any questions regarding the Kribensis, you should talk with an assistant at the fish store. They will be able to provide you with all the answers you need to keep healthy and happy fish, as well as give you information on other fish that can live in the same tank without problems. Kribensis or Pelvicachromis pulcher is of the family Cichlidae more commonly referred to as cichlids. They are native to the waters of West Africa, primarily found in Nigeria. They can be found in anywhere from free-flowing to brackish water. 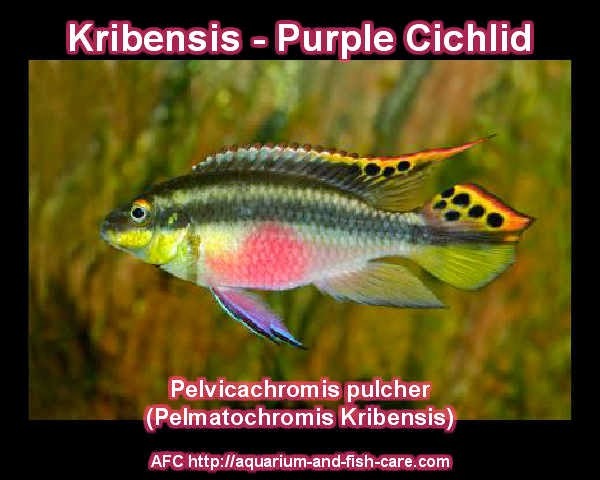 Kribensis are also referred to as dwarf African cichlids, purple cichlids, and kribs an abbreviation of their species name. Cichlids are among the most numerous and varied species on Earth. Over 1,300 species have thus far been identified and classified. Kribs are very popular among freshwater aquarists because of their almost saltwater quality coloration. Unlike most African cichlids, kribs have a temperament conducive to community living. They will adapt better to a community tank if given plenty of plants, rocks and hollow aquarium decorations to hide in. Kribs thrive in soft to medium hard water with a pH level between 6.5-7.0 and a temperature range of 75-82°. They are a medium sized fish reaching three to four inches in length as adults and have an average lifespan of five years. Kribensis are omnivores. They eat worms, insects, small crustaceans and plants in their natural habitat. In captivity, they are just fine on common variety tropical fish flakes. Distinguishing males from females is easy. The males are larger than the females. Unlike most tropical fish, it is the female who has the more vibrant color palette. Feeding them a diet high in protein such as brine shrimp, tubifex or bloodworms will help induce the spawning cycle. Privacy is essential to spawning. Kribs will seek out caves or hollow aquarium decor to spawn in. The eggs will be deposited on the roof of their mating chamber. Spawning is complete when the male leave the spawning chamber. Sometimes males will become aggressive toward the female after spawning takes place. If this happens the male should be removed from the tank. If it does not he may be left with the female. The female will stay in the chamber until the eggs hatch. This will occur in 36-48 hours. It is not uncommon for both adults to guard over the eggs until they hatch. In 3-4 days the fry will be free swimming. Both parents will demonstrate parental instincts toward their newly hatched offspring. They will herd the brood around the tank keeping a watchful eye on them. There are rare occasions when adult kribs have been reported to eat the fry once they are free swimming. This is not common. You can play it safe by removing the adults if you choose. A report issued by Barlow in the year 2000 stated that fry raised in an acidic environment will be mostly male. A neutral or slightly alkaline content will result in a heavier female population. I found this information one of the more interesting facts I came across while researching this cichlid. Free swimming fry can be fed liquid fry food available at most fish stores. A suitable alternative to store bought food is powdered eggs. Add it sparingly to avoid fouling the water. Fry are small. They don't eat much. The kribensis cichlids are some of the most preferred African cichlids. They are very small in stature. Unlike other cichlids, the kribensis are very peaceful. However, you should note that they become very hostile during breeding time. Nevertheless, they can be kept in a communal fish tank. The fish species is found in West Africa specifically in Nigeria and Cameroon. Their scientific name is Pelmatochromis kribensis. The name is a reflection of their purplish color. Their habitat should have a lot of plantation and rocks which enable them hide easily. They prefer living in fresh water of around middle pH with a bit of acidity and a mild temperature. The kribensis cichlids will feed on most aquarium foods. However, some foods with specs of meat will encourage them more in their breeding period. Their color is more pronounced in females rather than males. Therefore, they are easy to distinguish. Also, for the males, they have more color towards the back than the female kribensis cichlids. The tail will tell you this since it has some spots that are a bit dark. The fish are a bit fun loving and very social. Placing them with other kinds of fish will not pose a danger to the others at all. Although the kribensis cichlids need more swimming areas, you should include rocks and more places to hide. They are burrowers therefore you should be adding more sand in the aquarium. During the spawning period the female develops brighter colors. The belly in particular is turned to a bright red during this period. During the breeding period, the fish develop a higher degree of aggression. The fish life span could surprisingly reach 5 to 10 years of age. To sway away predators, the kribensis cichlids have some spiny rays towards the back. Their bodies are structured in such a way that they have a soft and perfect shape. This helps them during swimming helping them move around without much effort. During feeding, you should feed them on worms and insects. Flakes and pellets offer a good balance to their diet. It is advised that you feed the fish small amounts of food rather than resorting to feed them in a lump sum. This will encourage them utilize the food and minimize wastage that eventually turns the water in the tank dirty. A funny fact about the kribensis cichlids is that you can keep a male and a female together in one fish tank. The two develop lifelong relations. In the event of death of one of the pairs, it's time to buy a new pair. This is because regardless of how many replacement you make, the compatibility is impossible. When building their tanks, the tank should be able to accommodate between 80 and 90 liters of water. Since the kribensis cichlids are burrowers, include a larger amount of fine gravel. The substrate should be however free of quartzite substrates since they tend to interfere with larval development and may cause the death of fry.